Even before polling began for the byelection in the Kairana Lok Sabha constituency on May 28, BJP leaders had realised that another defeat for the party was on the cards in Uttar Pradesh. Kairana, which had fallen vacant after the death of MP Hukum Singh, slipped out of their hands after the humiliations in Gorakhpur and Phulpur. Rashtriya Lok Dal candidate Tabassum Hasan beat Singh’s daughter Mriganka by more than 44,000 votes to become the first Muslim MP from Uttar Pradesh—a state with 19 per cent Muslims—in the 16th Lok Sabha. According to BJP insiders, it would require greater effort to ward off the challenge posed by the Congress, which is in talks to ally with the BSP in Madhya Pradesh. Judging by the 2013 results, the combined vote share of such an alliance could beat the BJP. In the four Lok Sabha byelections held on the day, the BJP lost two seats. The Nationalist Congress Party took the Bhandara-Gondia seat in Maharashtra, which had been vacated after MP Nana Patole quit the BJP to join the Congress in December 2017. BJP-ally Nationalist Democratic Progressive Party retained Nagaland’s only Lok Sabha constituency (vacated after Neiphiu Rio resigned to become chief minister). The BJP won in Palghar, Maharashtra, which had been vacated after the death of its MP Chintaman Vanga, with a margin of 29,572, despite a four-way tussle in which its ally Shiv Sena was also an opponent. However, it cannot be denied that the loss in Kairana is worrying for the saffron party. It is a sign of the consolidation of Muslims, dalits, and even Jats, against the BJP. Kairana was communally polarised during the 2014 general elections after allegations of forced migration of Hindus. Singh had won by a margin of more than two lakh votes and the BJP had swept Uttar Pradesh, winning 71 of the 80 Lok Sabha seats. But the opposition parties—the Bahujan Samaj Party, the Samajwadi Party and the RLD—worked together in the bypoll. And, the angst of the people, particularly the farmers, helped them defeat the BJP. Other members of the BJP-led National Democratic Alliance are also feeling the four-year itch, ahead of the elections next year. After Maharashtra, where the Shiv Sena is proving to be a bigger opponent for the BJP than the opposition, its Bihar allies, the Janata Dal (United) led by Chief Minister Nitish Kumar and Ram Vilas Paswan’s Lok Janshakti Party, are showing signs of unease. It has been further compounded by the JD(U)’s defeat to the Rashtriya Janata Dal in Jokihat in the recent assembly byelections. Shah has started meeting the allies to pacify them. He called the BJP Bihar unit leaders to thrash out the seat-sharing formula for the state. Seat division in Bihar is likely to be tricky as the JD(U) is asking for a major chunk of the 40 seats. It had contested in 25 as a part of the NDA in 2009 and won 20. However, in 2014, Kumar walked out of the alliance before the election and the BJP won 22 seats on its own. The JD(U) managed only two. Moreover, if the JD(U) is given too many seats, the Rashtriya Lok Samta Party, which had joined the NDA ahead of the 2014 elections and won three seats, could severe ties with the BJP. The RLSP and JD(U) have a similar vote bank. There is a view that the RLSP is of little use to the BJP post the JD(U)’s return to the NDA. Paswan, whose LJP won six seats, met Shah in Delhi on June 3 to ask for an ordinance regarding the Scheduled Caste and Scheduled Tribe (Prevention of Atrocities) Act, 1989. JD(U) spokesperson K.C. Tyagi said Kumar should be the face of the NDA in Bihar and reiterated the chief minister’s demand for special status for the state. Kumar’s critical statements on Central government policies had sent the alarm bells ringing in the saffron party. 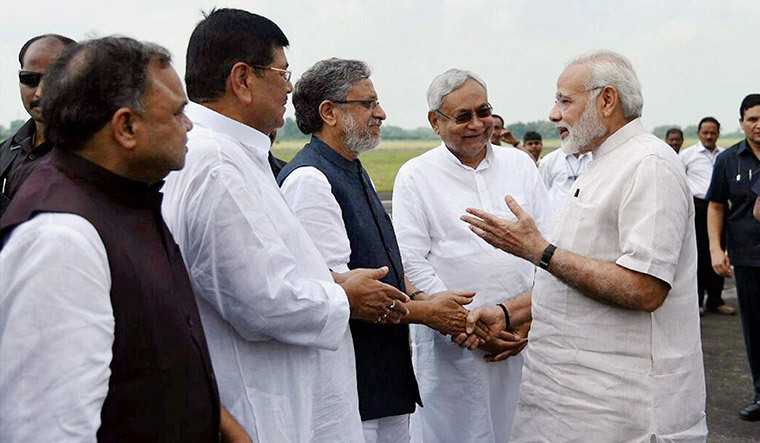 Bihar Deputy Chief Minister Sushil Modi, of the BJP, said, “The next elections will be under PM Modi’s image and Nitish Kumar’s work.”An NDA unity meeting is scheduled on June 7 in Patna. Shah also met Shiv Sena chief Uddhav Thackeray in Mumbai on June 6. The BJP managed to save Gujarat, but tougher battles lie ahead in Rajasthan, Madhya Pradesh and Chhattisgarh. These three states account for 65 Lok Sabha seats. Shah will be camping in Jaipur to micromanage the campaign in the state where his party appears to be the most vulnerable. The Congress’s charge in Rajasthan is led by Sachin Pilot, under whose leadership it tasted success in two Lok Sabha bypolls and one assembly bypoll this year. As a measure to pacify the farmers, these BJP-ruled states are looking at farm loan waivers. Cheques have already started flowing to the farmers in Rajasthan. The Madhya Pradesh government went to the extent of making five Hindu seers ministers of state to keep the majority community happy. Sops and developmental projects are being awarded in different areas. Chhattisgarh Chief Minister Raman Singh, who is carrying out a Vikas Yatra, has been announcing projects and laying down foundation stones aplenty. According to BJP insiders, it would require greater effort to ward off the challenge posed by the Congress, which is in talks to ally with the BSP in Madhya Pradesh. Judging by the 2013 results, the combined vote share of such an alliance could beat the BJP. 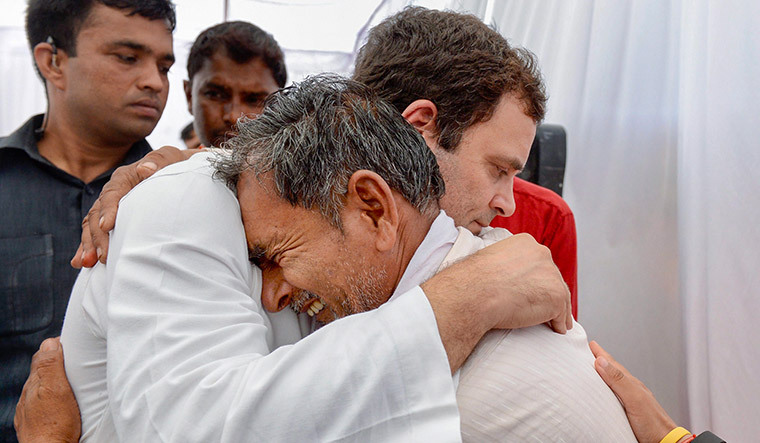 Congress president Rahul Gandhi addressed farmers at a rally in the state on June 6—the anniversary of last year’s farmer’s protest. He announced that famer loans would be waived within ten days if the Congress comes to power in Madhya Pradesh. Despite factionalism in the state unit, the Congress is hoping that Kamal Nath, Digvijaya Singh and Jyotiraditya Scindia can work together to dislodge three-term chief minister, Shivraj Singh Chouhan. The BJP, however, is confident that the differences between the Congress leaders will work in its favour. For the newly-found opposition unity to remain intact, Congress victories in these states is a must. Only then can it be the pivot of the anti-BJP alliance. If the Congress manages to wrest any of these states, then Gandhi will have more of a say in the alliances emerging throughout the country.